Jesus told to Nicodemus when asked regarding entering the Kingdom of God: “You must be born again“. What was this new birth that he was talking about? The following biblical terms (based on the NIV version) are interchangeable and mean the same thing – the Celestial Kingdom: Kingdom of Heaven (used almost exclusively in the gospel of Matthew); Kingdom of God (the most common expression used 65 times in the gospels, book of Acts, and some of Paul’s letters); and my [Jesus’] Father’s Kingdom (used once in Matthew 26:29). “Being born again”, which has also been translated as “born from above” has the following equivalents, all referring to the new birth (1 Pet 1:23): born of God (John 1:13); and born of the spirit (John 3:6-8). So those who wish to enter the Celestial Kingdom (be saved) must first undergo the new birth. What does that mean? Salvation and redemption means becoming at one with God or at-onement. This cannot be achieved through faith in Jesus’ sacrifice on the cross or even just human overcoming of sin. (Jesus’ sacrifice can do nothing as far as transformation of individual souls.) The only way a person can achieve unity with God is through being born again or anew (John 1:13; 3:1-8) whereby the Holy Spirit imparts the Love of God to them and transforms their soul from being in the image of God to acquiring divine substance. By sincere prayer, an individual may seek and receive Divine Love, which through soul transformation makes the person a part of divinity – though not a god or equal with the Father. However, they receive the substance of God in their soul and move beyond the mere image of the Creator. As a result, they become immortal and no longer subject to death. Without the Divine Love, humans are neither divine nor have God living in them. They are only created in the image of God, not possessing the substance of God. This too applies only at the soul level, not the body level, for God does not possess a body in human shape. The new birth means that the soul, made in the image of God, is by the Divine Love transformed into the substance of God. The Bible also refers to the result of this process as becoming a new creature / creation; being born again or born of God; and rebirth and renewal by the Holy Spirit (John 1:13; 2 Cor. 5:17; Gal. 6:15; 1 Pet. 1:23; Titus 3:5; 1 John 3:9 and 4:7). Through the new birth, humans can become at one with the Father. This is the effect of the Divine Love flowing into one’s soul and replacing all that tends to sin and error. As the Divine Love takes over the soul, it changes it to the quality of the Great Soul of the Father. Thus the human becomes divine and immortal with their soul not only in the image of God, but also of divine substance. 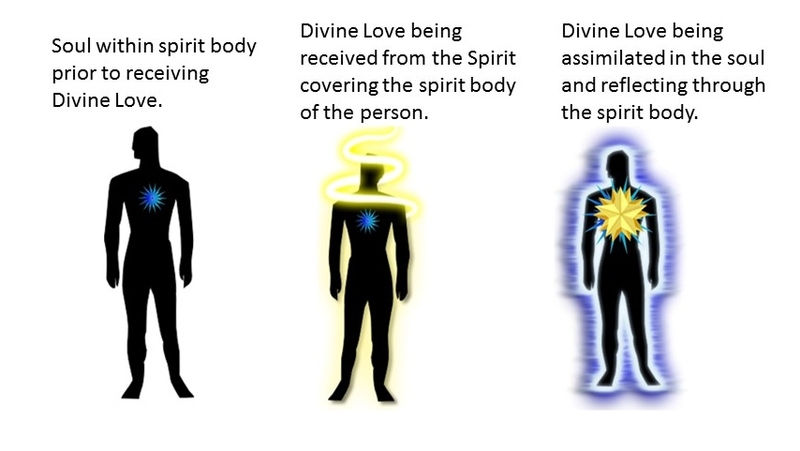 This, upon passing into the spirit world, enables them to enter the Celestial Kingdom of God.